The De-stoner efficiently eliminates heavy particles, such as stones, magnetic and nonmagnetic metals, mud balls etc, from paddy, cereals and other grains. Both round particles and those with a small diameter of up to 1.75 mm as well as heavy material of hygroscopic structure, limestones, bricks chips, glass and other contaminants are also removed. The De-Stoner is being used successfully in rice mills, oat mills, wheat, rye, corn milling units, in silos (grain elevators) and food processing plants of many kinds. 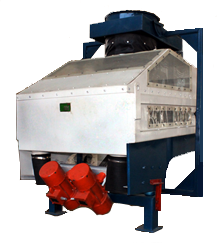 The machine is provided with suction system includes blower and can be supplied with cyclone, airlock as per demand.